The people who know me well will tell you that amongst many other things like writing, traveling, reading, biking, rollerblading, watching movies, photography and of course tasting wine, I love music, any genre and from anywhere. That said, the music that makes me sing and moving to the sound (not dancing because I'm a really bad dancer, but at least I try...), is music with the sun in it. Music that put you at ease and warm you up with soft, generous penetrating sounds, soulful voices and lyrics that tell you a story about the men and women behind music itself and its various origins. The music that really inspires me and put an exotic touch in my everyday life via the hear-pieces of my phone or music player, come from all around the world, but mostly where the sun is king and music is celebrated with joy as a full part of the culture and the everyday joie de vivre despite the misery that too often surrounds the people who live in those countries, like in Brazil, Africa, the Caribbean Islands, South America, India, and more. Music is for them an inspirational and complex form of spiritual and corporal healing process, an expression of all of their senses and emotions. You can feel their joy, fear, passion, stories as they usually express their lives, their status, the expression of what they really feel inside and what they want to say about themselves and the world the live in. 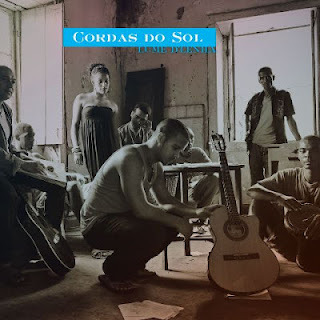 The last album of Cordas do Sol "Lume d'Lenha" mixes the sounds of the world in a beautiful way. It is a blend of Brazilian Bossa Nova and Creole music with Andalusian guitar and African accents and even some reggae notes part of their traditional Batuku and Kola SanJon music. The band created in the mid-1990 comes from the island of Sant'Anton, in the Cape Verde archipelago, which explain the Portuguese, African. Creole and even to a certain extend Spanish influence in their music. Their music is a bliss to my hear and I love the complexity and rhythm of their songs. If you want to put a bit of sun in your daily routine, then this album is a must. 3 songs especially will delight your day and make you undulate and move your entire body following the cadence: "Manhe Joana", "Séte"and "Sorron Resóde".